← Tips for keeping your Fashion Jewelry looking like new! We have new Lashbrook rings in stock. Stop by one of our stores and see these amazing bands in person! 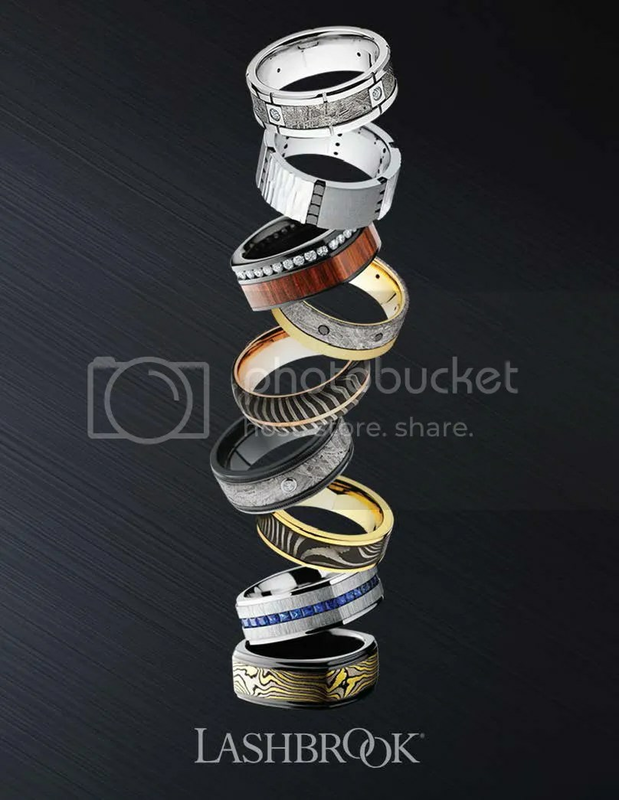 Information about the Lashbrook Collection: Lashbrook’s winning rings take traditional bands to the next level by combining precious metals and precious gems with performance metals. The winners of the JCK Jewelers’ Choice Awards are determined by jewelry retailers. Eager to give credit, our in-house design team draws inspiration from our customers’ creativity – staying true to our custom identity. Cobalt Chrome is a lustrous hypoallergenic metal. This bright white metal has a nice heft and will stand up to wear and tear. Cobalt chrome is beautiful and versatile which allows us to create stunning classic or contemporary styles. Titanium – flush, bezel, channel, bead, and tension set Cobalt chrome – flush, bezel, channel, and bead set Zirconium – flush, bezel, channel, and bead set Damascus steel – bezel set only Precious metals – flush, bezel, channel, and bead Metals. Lashbrook hardwood rings are virtually water resistant and available in many colors. The infusion process used to produce our wood product gives it the density of brass and it can simply be buffed and polished. No stain, lacquer or other sealant is needed. Hardwood rings can be made in any of our metals. Virtually every style we offer in performance metals can be made in precious metals: 14K, 18K, white, yellow, or rose gold, palladium or platinum in every price imaginable. At Lashbrook, we use aerospace grade Ti6Al-4V Titanium to make all our Titanium bands. This grade is more than twice as strong and twice as hard as typical commercial Titanium rings. We offer more than 50,000 styles in Titanium alone. Titanium is the perfect choice for light weight and heavy strength. This entry was posted in Jewelry, Jewelry Metals, Jewelry News, Wedding Rings and tagged Jewelry, jewelry warehouse, lashbrook, mens jewelry, mens rings, wedding bands. Bookmark the permalink.